5 Myths About Your Baby and Eating. Well-meaning grandparents… baby blogs … and moms with older children—they’re all ready to serve up ideas on when and how to introduce your baby to solid foods. Before taking any well-intentioned advice, read these five common myths about babies and their transition to solid food. 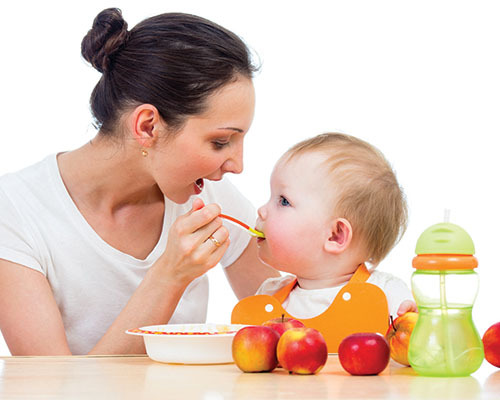 Myth #1: There’s a set age for babies to begin solid foods. Can your baby hold up his or her head? Does the baby show interest by opening his or her mouth for food? Can your child move food from a spoon into his or her throat? “Babies develop at different rates, so ask your pediatrician to help you decide if your baby is ready for solid foods,” said Jennifer Tidroski, DO, Pediatrician at Ponderosa Pediatrics in Prescott. Myth #2: Rice cereal should be baby’s first food. Fruits – Apples, avocados, apricots, bananas, mangoes, nectarines, peaches, pears, plums, prunes and pumpkin. Vegetables – Carrots, green beans, peas, sweet potatoes and squash. Grains – Barley, oatmeal and rice. Meats and Other Protein – Pea-sized pieces of cooked chicken, turkey or boneless fish; lentils as well as black, red or pinto beans. Myth #3: Putting baby cereal in a bottle is a good way to introduce solid foods to your baby. Feeding a child cereal with a bottle is a potential choking hazard. Also, bottle feeding cereal may cause your baby to eat more, which could lead to unhealthy weight gain. Myth #4: Don’t feed your young one foods that contain peanuts because of the risk of an allergic reaction. The National Institutes of Health recently issued new information on early exposure and peanut allergy prevention. New guidelines suggest parents can introduce most babies to peanut-containing foods around the time they begin eating other solid foods. The key word is “most.” Babies with eczema or an allergy to eggs are at high-risk for peanut allergies so parents shouldn’t chance exposure. If your pediatrician says your baby is ready for peanuts, start by blending small amounts of peanut butter into yogurt or incorporating sprinkles of peanut powder into food. Whole peanuts are not recommended due to the danger of choking. Myth #5: It’s okay to place a container of baby food in the refrigerator if the baby doesn’t finish it. Leftovers are not safe if you feed your baby straight from a container as saliva from the spoon can contaminate the remaining food. It’s better to place baby’s food in a dish, discarding any not eaten after the meal. The remainder of food from the container can be refrigerated. No matter when your baby starts eating solid foods, don’t be surprised if the first few meals end up anywhere but in your baby’s mouth. Eating solid foods is a skill your baby will develop with practice. If your child does not have a doctor, contact Ponderosa Pediatrics in Prescott at (928) 778-4581. For more about caring for children, visit our website (ponderosapediatrics.com) and follow us on Facebook (facebook.com/PonderosaPediatrics).